Archbishop Wood’s point guard Jackie Pierson, left, goes up to block O’Hara’s Aminah Farmer. A trivial three-point bomb from center court was way off the mark, and a sea of purple flooded onto center court. Cardinal O’Hara had defeated Archbishop Wood and captured the girls’ Catholic League championship, 31-25, before a boisterous crowd Monday night at a packed Palestra. But why was everyone wearing purple? O’Hara senior guard Mackenzie Rule’s father, George, recently succumbed to a battle with cancer. The O’Hara community rose to the occasion to support Rule with constant support throughout the tremendously taxing ordeal. So, during warm-ups, the Lion players wore purple shirts with the slogan “No One Fights Alone,” in memory of the entire Rule family. 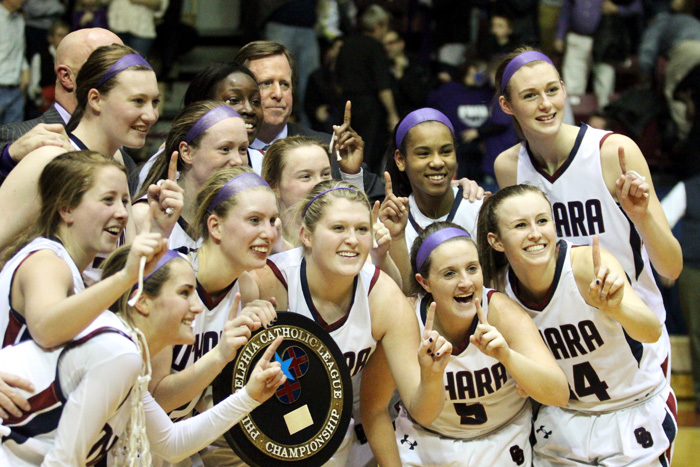 Thousands of O’Hara’s fans wore them as well and most kept them on throughout the game, and when the buzzer sounded, hundreds of loyalists raced to the court to celebrate their school’s first title since 2008. Off the court, in addition to their support of Rule, have been fundraisers and several special get-togethers. On the court has been just as successful. Heading into a District 12 championship tilt against Public League champ Central this coming Saturday, the Lions’ 21-5 record includes an impressive Catholic League semifinal victory over defending Catholic League champion and number-one rival Archbishop Carroll, followed by a championship triumph over the three-time defending Class AAA state champion Vikings. A huge part of that mission was finding a way to score points – something that both teams seemingly forgot how to do during long stretches of ineptitude. In the end, it came down to some key free throws, and when thousands of people are screaming against you and thousands more are yelling in your support, the difficulty of making a foul shot is a bit more arduous than standing around during practice just shooting the breeze. Guy was referring to the fourth quarter during which she connected on four pivotal free throws, two of which pretty much clinched the contest. She also finished 8 for 10 from the line and scored 10 points, the only player on either team to reach double digits. Though both teams have displayed offensive firepower during the season, the chemistry between the two squads usually includes rugged defense and lots of unattractive statistics. Like their regular-season encounter that ended in O’Hara’s favor by a similar score, 31-27, the championship often resembled a rugby match. The final numbers were, in a word, ugly. Wood (10 for 34) actually outperformed O’Hara from the field (7 for 24), but not by much. At the foul line was a gaping disparity as O’Hara hit on 17 of 26 while Wood connected on 5 of 10. Fittingly, the last person to snip the net in the traditional post-game ceremony was Rule. She lifted it to the sky, the crowd roared, and she draped it over her shoulders.